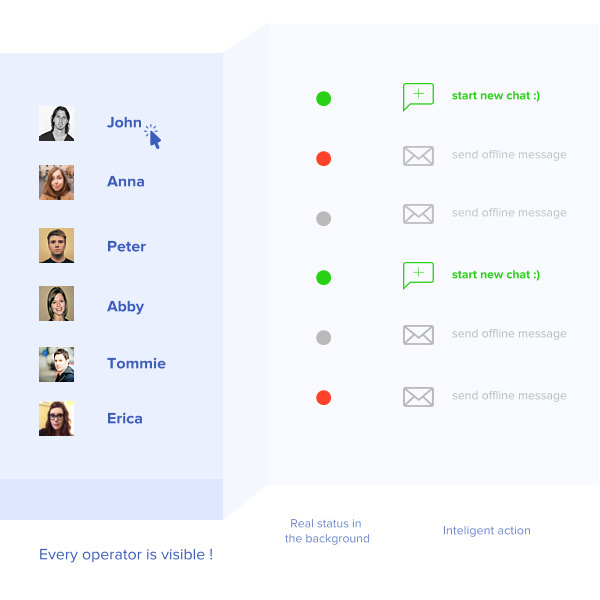 If you have several operators on your team and the need to have control over their activity, you will love the new features we have prepared for you. 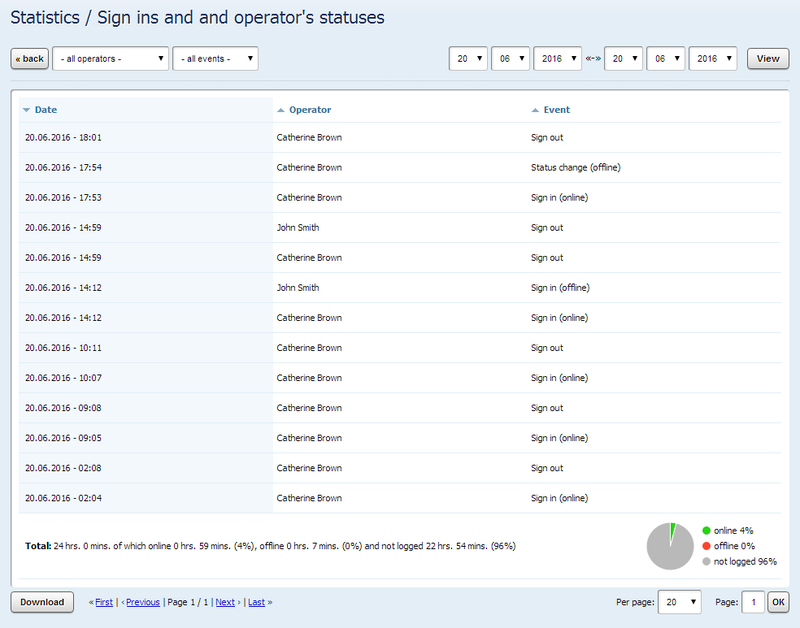 The administrator interface has a new feature that allows you to check the status of operators in real time. You may have already noticed that the Operators section now includes the indicators demonstrating current status. If the name of the operator has a gray point, they are currently not logged in to their account. 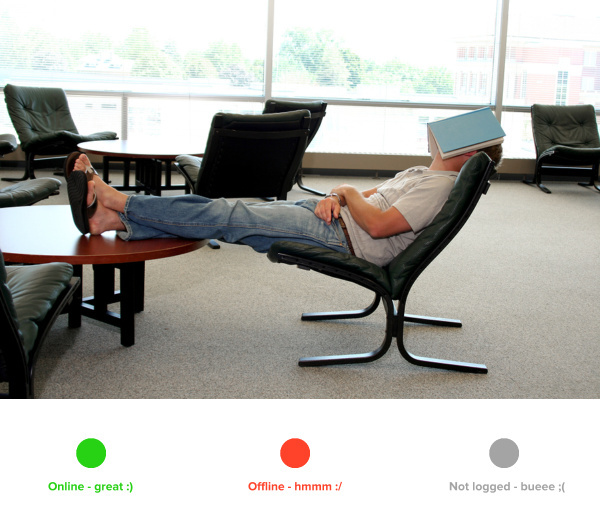 In the event that the point is red, the operator is logged on, but is in an offline mode – a visitor is not able to initiate a chat with him. Just recall that the offline status can be set by the operator themselves or it will be automatically changed by the system when reaching the maximum number of chats if this feature is turned on. 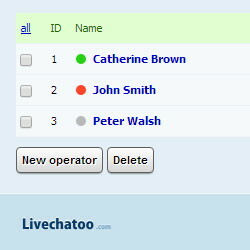 When the name of the operator has a green point, this means that the operator is online, and visitors can contact them. In addition to tracking the operator status in real time, we have also incorporated the statistics and two new statistics for logged in operators have been added. In the first new statistics, Logging and Operator Status, there is a listing of the operators – when they logged in, changed their status to Online or Offline. For each action, there is the time when it was made. This data can be filtered by operator, office or by a specific event. Of course, you can also download it .csv format. The second statistic, Overview of Operator Status is a graphic summary of each operator status during the selected period. In the chart you will find information about the three states of the operator – logged in, offline or online. Data can be displayed in the form of a bar graph. Of course there is filtering based on operator, period or selection of chart units. An interesting feature that can be used for internal analysis, is the grouping into units on the X-axis. Another innovation concerns the chat window. It is suitable for clients who need to make some of their operators available even when they are offline or not logged in. This applies to the manual assignment of an operator in Online status. The standard setting is such that if at least one of the operators is Online, the client can no longer contact Offline operators. However, if the department uses it for e.g. a complaint, it is appropriate for the operators to always be available and the client not to have to leave a message. A new feature allows the list of online operators to include either all operators or only offline operators. If you set the option to include all operators, the client actually sees all operators – online, offline and not logged in. When setting up a display of only Offline operators, there will be listed only those who are logged in and have an online or offline status.